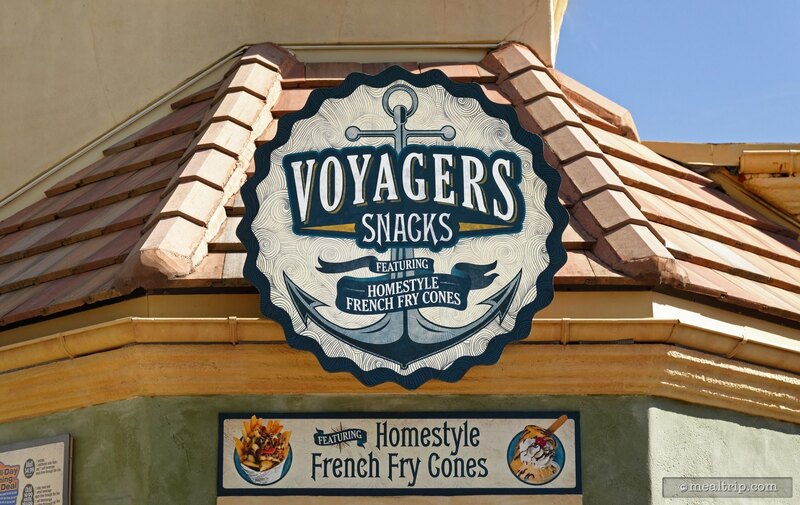 This great little kiosk window outside of Voyager's Smokehouse changes it's name so frequently I can't keep up with it! 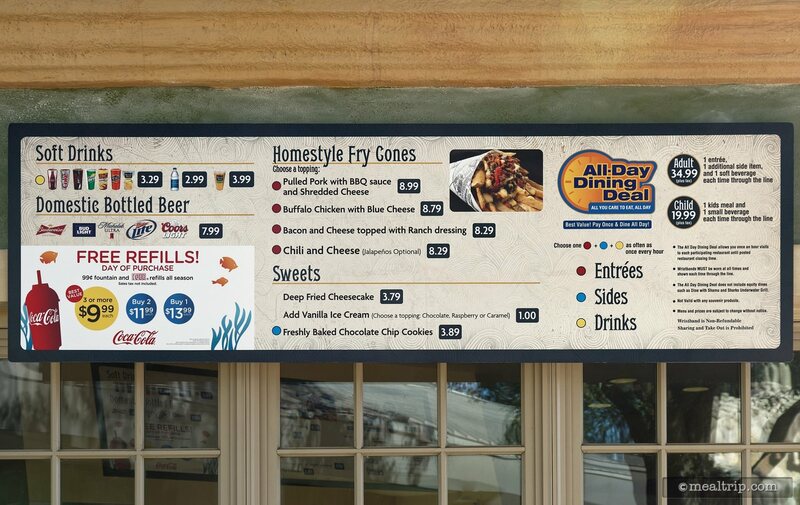 They've served all kinds of fast-food snack type items over the years, from dessert style funnel cakes all the way over to what's being offered now -- Homestyle Fry Cones! 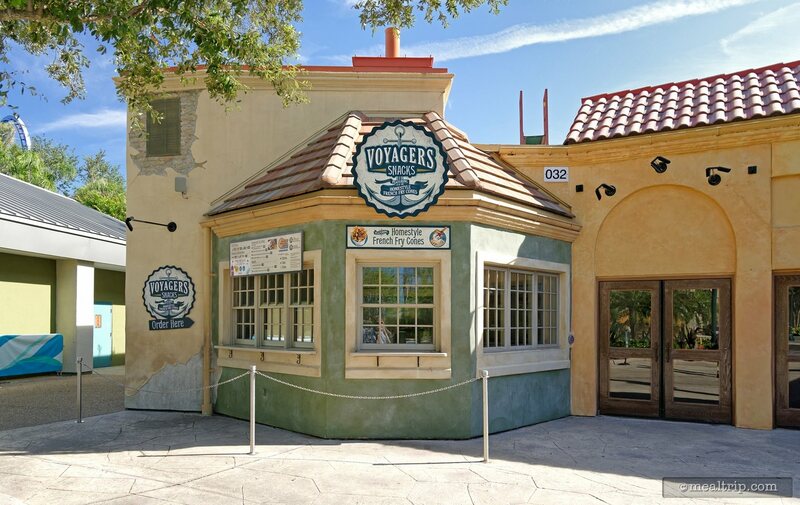 We're just leaving all of the exterior photos and menus -- and even some of the food items we've enjoyed over the years in this one "Voyager's Snack Window" listing. 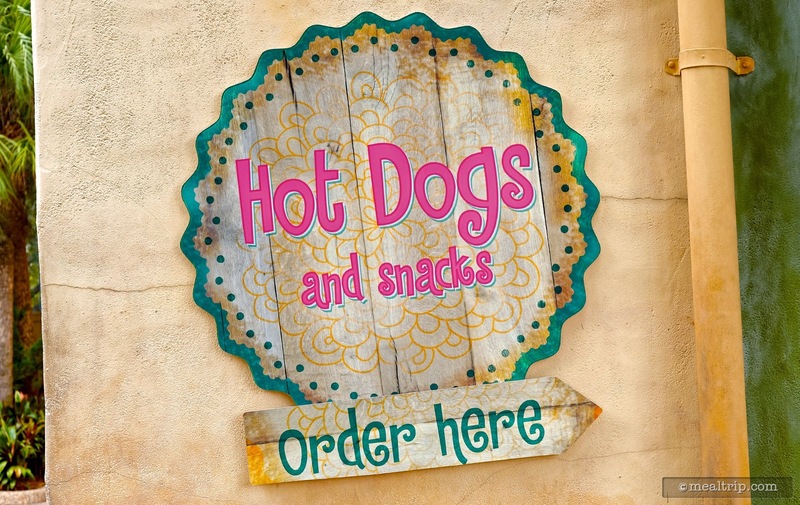 If history is any indication, food items (and maybe even the kiosk name) will be changing up soon -- but we've always really liked whatever has come out of that little window. Yay!!! So keep up the good work little window booth… whatever you're going to be called next. 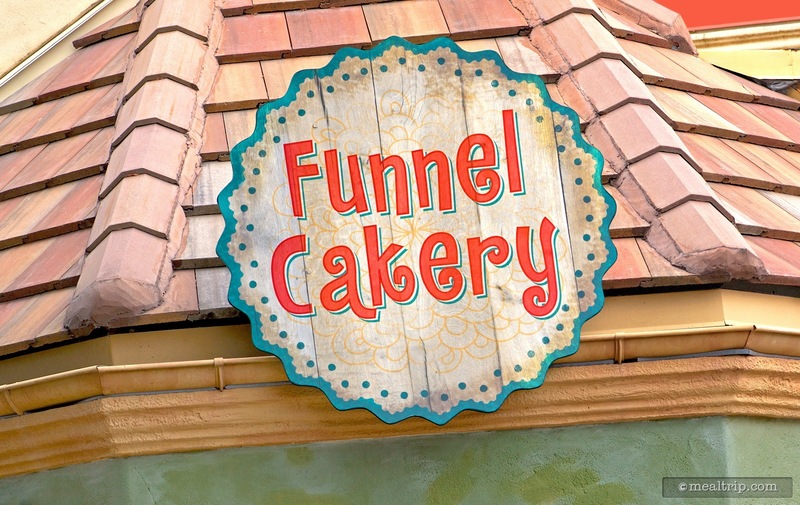 I must have walked by the old "Funnel Cakery" window (located just to the left of Voyager's Smokehouse at SeaWorld) a couple of times without even realizing that the sign had changed back to "Hot Dogs and Snacks" from "Funnel Cakery". The signs are, very similar looking. 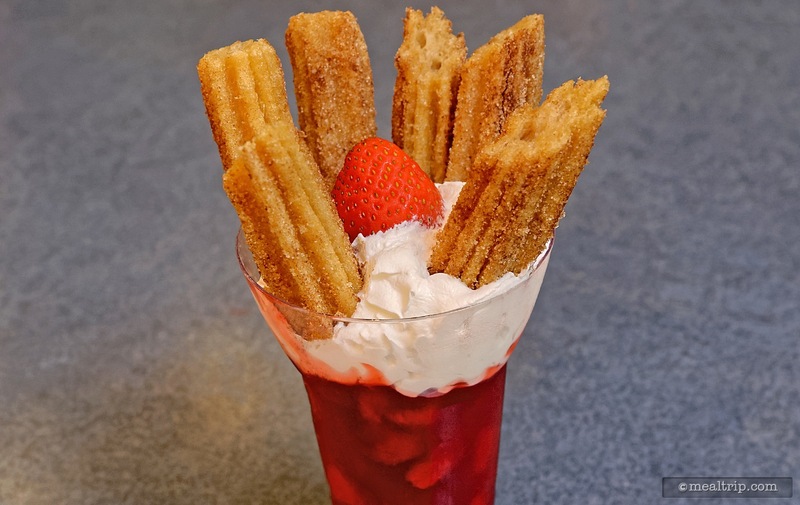 What did make me stop and take notice, was seeing a somewhat elderly couple sitting on a planter wall nearby… each with at tall, gorgeous parfait cup of red strawberry filling with churros sticking out of the top! I had to investigate further. 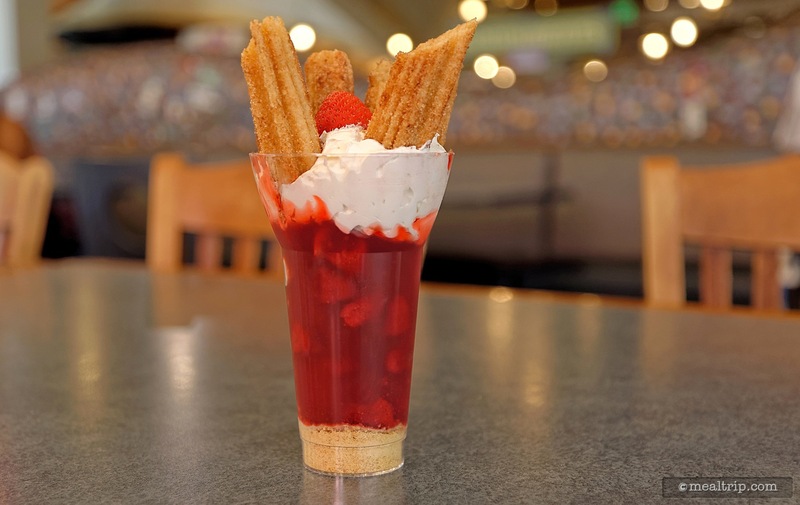 As it turns out, sometime in late spring (2015), the Funnel Cakery stopped serving funnel cakes (and hot dogs) and started offering these tall Churro Dipper cups (and hot dogs). 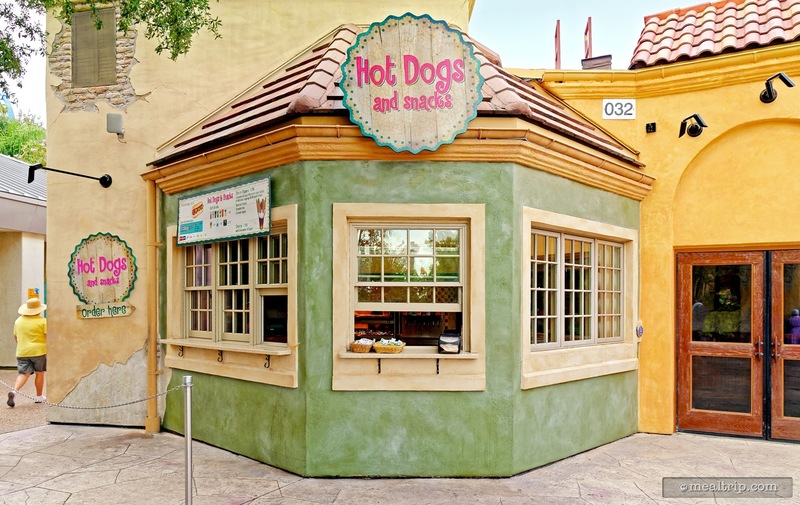 Oddly, I can't say as though I've ever seen anyone order a hot dog from this window. 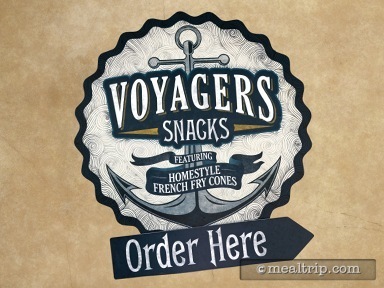 Perhaps a new sign is in order.. how about just "Voyager Snacks"? We really like most of the stuff coming out of the mini window kiosk… I'm just not crazy about the name. The new Churro Dippers are not new culinary discoveries, but they're not supposed to be. This is just a good, old fashioned, theme-park style dessert treat. You start with a decent sized parfait cup with a couple tablespoons full of a gram cracker-like powder added to the bottom. 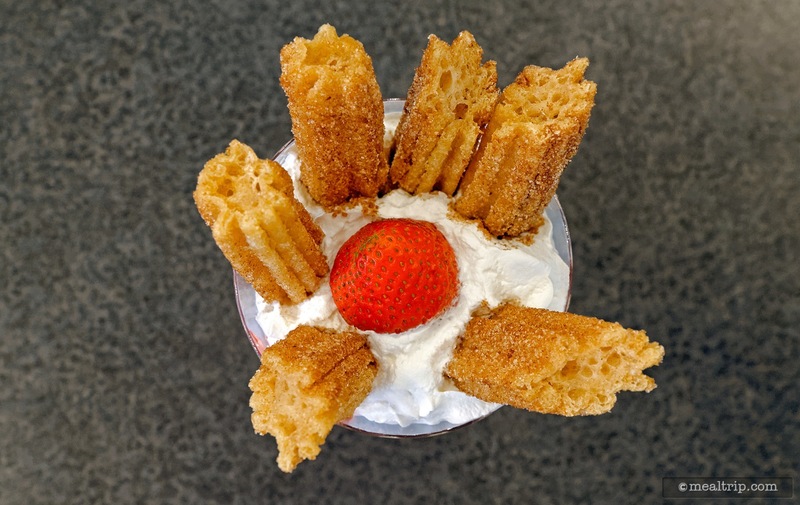 Then you get a choice of strawberry, apple-caramel, or Bavarian cream filling (this is pre-measured and kept cold), then… fluffy (can-based) whipped cream is added, and it's topped off with six pieces of fresh, hot cinnamon and sugar churro bites (they're about four inches long). It's a real head-turner when it comes out of the window, but it doesn't stay pretty for long… this is one of those dessert snacks you really just need to dive into (and in my case, keep a few napkins close by). The mix of hot churros with the cold pie filling (or vanilla cream) is a great temperature contrast, the gritty sugar and texture of the churro itself against the creamy smooth filling is another great contrast, and while the top 80% of the dessert is sweet… I really liked the plain-old gram cracker-like powder at the bottom. Once you got down there, it provided just the right amount of "not so sweet" to go with what was left of the strawberry filling. 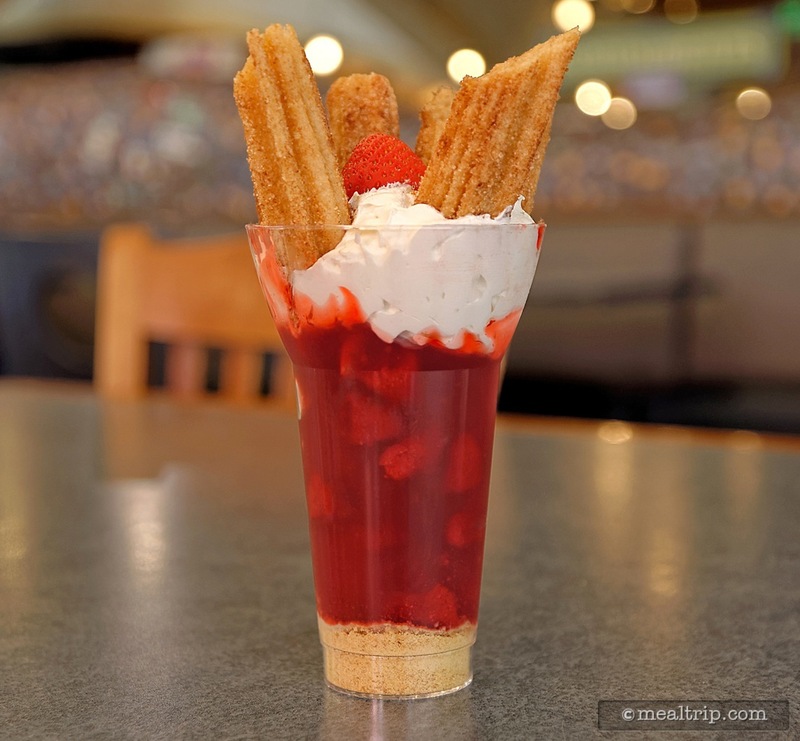 As good as the new Churro Dippers are, they don't really have that same "wow… I've got to get another one of those the next time I go" craveability factor that the hot, fresh Funnel Cakes used to have. That's too bad, because this new dessert is definitely worth a try. 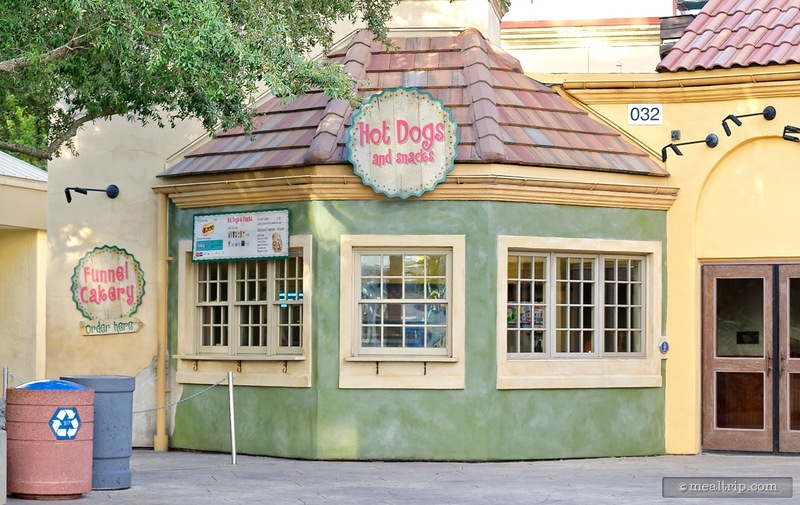 As far as the Hot Dogs and Snack window itself… it is a grab-and-go station… and I usually "go" to the nearby Voyager's to sit down. The little kiosk itself doesn't have much in the way of atmosphere, and it's unfortunate location at the corner of a building and on a main walkway, always make me feel like I'm standing in someone's way. We'll have to keep an eye on this little window though. It seems that good stuff comes out of it. 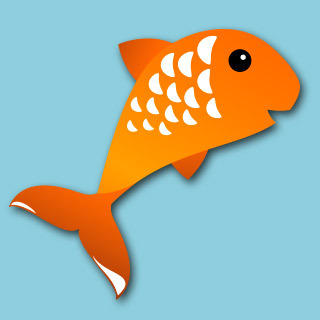 I just hope something sticks soon, and the name is permanently changed to reflect the items available. 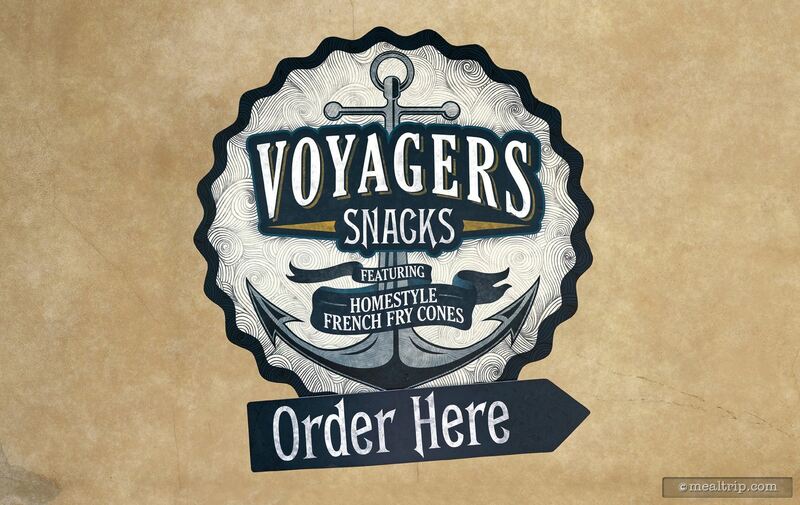 If the snacks are going to change seasonally, perhaps something like "Voyager's Port-Side Snacks"? Once you've got decent treats and snacks… theming can take even just a simple corner window booth, and make it something to write home about. This was my first time to try a funnel cake and glad I did. 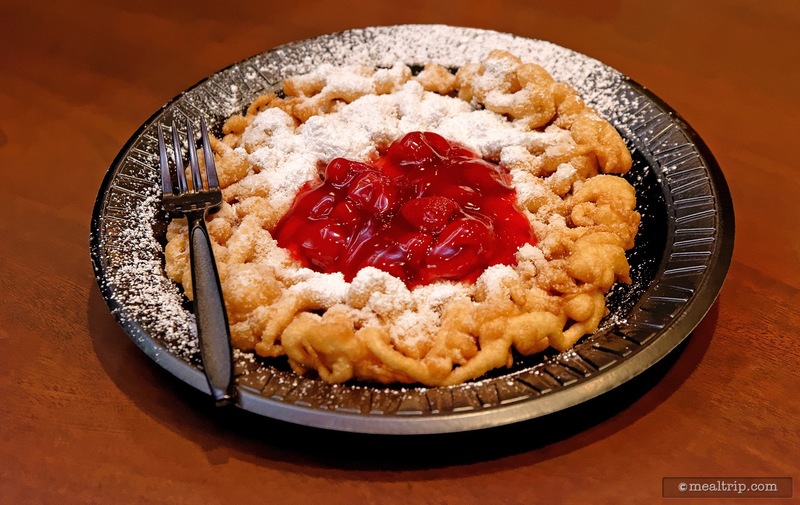 I chose the strawberry and powdered sugar funnel cake. It was freshly made topped with a strawberry sauce and a heafty amount of powdered sugar. I found my favorite dessert at Sea World and looking forward to my next visit to enjoy another one soon.